View sharp details and vibrant colours on the Tosiba 80 cm (32 inches) HD Ready LED TV (Black) that supports 1366 x 768p resolution. The LED backlight technology of the HD Ready TV allows an ideal brightness and vivacious picture on the display always to enhance your television viewing experience. Even fast motion scenes do not blur in your action movies and sports matches as this HD Ready TV features 100 Hertz refresh rate that provides crystal-clarity in rapid motion scenes. You can enjoy both live telecast of your preferred TV shows, movies, music, videos etc. as well as playback your stored multimedia collections via the built-in HDMI and USB interfaces. 80 cm (32 inches) HD Ready LED TV works well for L-PCM audio format and JPEG, Movie and MP3 video formats to give you a complete media entertainment. 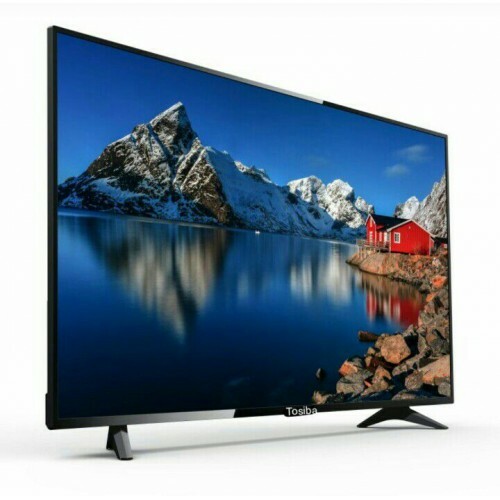 Enjoy an impressively realistic image quality on your 80 cm (32 inches) HD Ready LED TV that comes equipped with the CEVO engine to work greatly on the scenes, contrast, saturation and colours. As per the requirement of a particular scene, both saturation and contrast are calibrated so that there is no loss of the authentic colours. This process yields in enhanced vibrancy and depth in the picture on screen. You can watch football tournaments with crystal-clear and crisp details even in the most wide angle views, panoramic shots and fast motion actions. (32 inches) HD Ready LED TV ensures optimal details and depth on the display no matter how much be the exposure from glare and spotlights. Boundary shot views will not blur, the green of the grass will look more vivid and overall there will be an improved brightness, clarity and colour-radiance in your Football matches. The Game mode on the other hand provides more dense and sharp scenes, the dark ones included, enhancing your sports viewing entertainment manifolds. The 32 inches 80 cm (32 inches) HD Ready LED TV ensures that your precious eyes remain protected from the harm caused by continual hours of watching. A break time timer will appear on your television screen indicating you for how long you have been viewing movies, music, videos, shows etc. so that you can take proper eye rests after adequate durations.